You’ve just finished your slate, and now it’s finally time to sing the song you’ve been preparing for months. You open your mouth to sing, but the first note out of your mouth makes a horrible cracking noise. 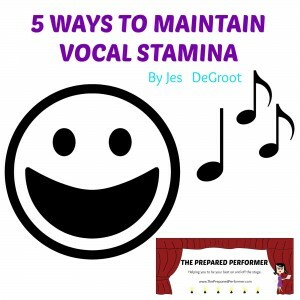 Fortunately, there are many ways to avoid getting stuck in a sticky situation such as this, and here, I’ve gathered five of the main ways to maintain vocal stamina. Practicing every day builds up strength in your vocal muscles. Now, I know some of you young performers might feel uncomfortable singing all those strange sounds in front of your family—I did, too—but you’ve got to get over it. If Neil Patrick Harris can stand onstage at the Oscars in front of millions of people in ONLY HIS UNDERWEAR, then you can sing a few simple exercises in front of mum and da. If you are unsure of where to start, try doing lip rolls and sirens. Molly also has some awesome videos. I use them daily. Practice makes perfect! Dairy products containing lactic acid such as milk, cheese, butter, and ice cream can cause phlegm. Excessive phlegm is an irritant and may lead to problems. A common problem is persistent throat clearing, which may put a strain on your vocal chords. Strained vocal cords can lead to a sore throat and singing notes that sound harsh. Other foods such as chocolate, tomato based sauces, peanut butter, spicy foods, onions, alcohol, mints, caffeine, and foods that are fried, can all have negative effects on the singing voice. Although they don’t directly cause phlegm, they can cause acid which will lead to phlegm production. Your best bet is to stay away from these foods on the day of your audition or performance if you’ve been having problems with voice strain. Foods that might have a positive effect on the vocal cords and help properly lubricate them are watermelon, cantaloupe, aloe vera juice, apple juice, and melon, but I would suggest you try these out on a day with nothing at stake. Keeping you vocal cords well lubricated requires glug, glug, glugging down LOTS of water—about six to eight glasses per day. (Coffee and soda do not count!) The saliva glands in your vocal cords can be further be stimulated by adding a squeeze of lemon to your water for additional lubrication, but be careful it’s only a little, adding too much may cause phlegm. It’s important to note that while staying hydrated is great for your voice, drinking cold water tightens vocal cords. Warm or room temperature water is what you need to sip on when warming up or during a show. When you’re on the go, the first thing we all typically neglect is sleep. But don’t do it! If you function on less than eight hours of sleep regularly, your vocal cords can become vulnerable and easily be damaged. So sleep, sleep, sleep! And if you’re voice feels fried or tired, be sure you DO NOT WHISPER. When you whisper, your vocal folds become taught and will lack the proper vibration needed to keep them moist while in use. Whispering will end up drying out your instrument, causing your voice to feel and sound even worse. Incorrect breathing is one of the main factors leading to vocal strain, so make sure you are doing it properly. When singing, breathe deeply from the place called your epigastrium. If you put your hand on your stomach as you breathe, you can feel the diaphragm going down as the epigastrium expands. You can also feel your stomach becoming bigger as you inhale and smaller as you exhale. Molly has a great tutorial on this if you’d like more specific information. Remember, all of us go through voice issues from time to time. Hopefully, using these five methods will help you to maintain your vocal stamina. Good luck on those auditions! For more information about vocal health, check out this great website!